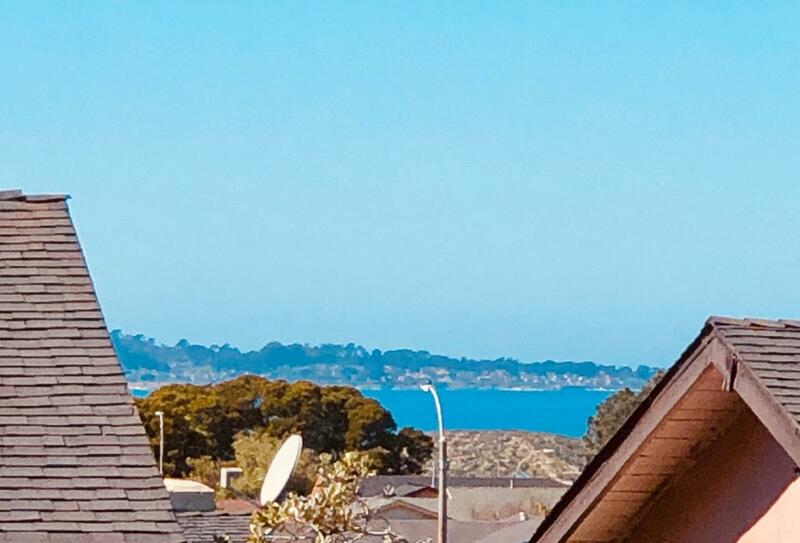 Live near the beach, restaurants, shops, and CSU-Monterey Bay in this single story cottage with views of the Monterey Peninsula. You will love this extra-large cottage in upper Seaside. French doors, plantation shutters and double-pane windows exude cottage charm.. Walk up the entry to a front porch and notice ocean views. Eat-in kitchen. The master bedroom offers privacy and garden views. It faces east, receiving morning sun. Original oak flooring is underneath the carpet. The second bedroom is small and has a unique built-in closet-dresser and newer wood laminate flooring over the original oak floors. This room faces the ocean and has a unique mid-century built-in desk that is perfect for a computer. The bathroom is off the living room and kitchen area in the middle of the house. It is very large and offers a toilet separated by doors from the sink area. The laundry area is an actual room off the living room. It has room for a washer and dryer and storage.